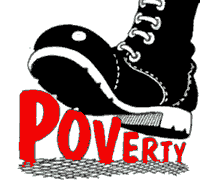 kc bob: Will we ever eliminate poverty? Jesus' words have sometimes been misunderstood; some have even suggested He was being insensitive to those living in poverty. But nothing could be further from the truth. Repeatedly the Bible commands us to be concerned for those in need, and it points out that God has a special concern for the poor. Remember: Jesus knew what it was to be poor; Mary and Joseph had very little in the way of material goods. The Bible says, "Whoever is kind to the needy honors God" (Proverbs 14:31). Will we ever eliminate poverty? We should do all we can, but the real barrier is our human nature. Unless Christ changes our hearts, the human race will always be riddled with greed and corruption and selfishness. Put your life into Christ's hands, then ask Him to use you to help others overcome both their material and spiritual poverty. ... from Billy Graham's daily column. Click here to read the whole piece.